Stunning 3 br/3 bath sleeps 8 / STEPS AWAY FROM PICASSO MUSEUM!! 19th Century hat factory converted with art and style into a sophisticated apartment in the heart of the Marais. Just one block from the Picasso Museum this apartment was completely renovated in 2007. It is detailed with taste and thoroughly modern in comfort and amenities. See photos below. Located on the second floor (third floor American) the building is equipped with an elevator. The 3 Bedroom option is a combination of our 2 Bedroom apartment and the adjacent Studio apartment. There are 3 bathrooms, and two fully equipped open “American” kitchens. There is both stair and elevator access to the quiet second floor (American 3rd floor). The two units combined into the 3 Bedroom arrangement offer 80 square meters in size (900+ square feet). Located on the serene street, rue de Thorigny, the apartment was laid out and designed with meticulous attention to every detail. We have incorporated custom furnishings, antiques and original art. Traditional floor to ceiling windows over look the street flooding the living and dining areas with light. The bedrooms are located at the back of the apartment and have windows for excellent cross-ventilation, built-in closets, high quality linens, brand new mattresses and their own bathrooms. A free pick-up is included in the price of the rental, making your arrival into the city very smooth! At the apartment you will find our personalized handbook which will have tips for enjoying the neighborhood, a list of our favorite restaurants, emergency numbers and instructions for using the appliances. The rental price includes everything except for possible extra phone charges although most calls are free even those to the U.S.
Our location is extraordinary with great restaurants, art galleries and fashionable shops at your doorstep. There are narrow streets that have not changed for centuries. You will be 1 block from the Picasso Museum, an easy walk to Place des Vosges, the Musee Carnavalet and the Pompidou Center. It is an easy stroll to Notre Dame and the Left Bank. Rue de Bretagne, famous for its food purveyors and its historic covered market “Enfants Rouges” is a few short blocks away. Excellent access to the metro. St. Sebastien Froissart is the closest metro stop - about a 5 minute walk. Bus service is excellent as well. Separated in two apartments. Can be accommodated as you want. Recommend the place most highly. We will try to get it again. There were 7 of us staying in the 2 apartments. The combination was convenient and spacious, especially remarkable since it is in the center of Paris. My 3 teen-age grandchildren who can be teen-age critical were happy. They and the rest of us had a great time. One adult was unable to come on short notice, but the accommodations would have handled him without problem. The pick-up from the airport given the red=-eye from the U.S. was a really convenient help. There are lots of shops, brasseries and bistrots within a couple of blocks in every direction. Getting around to sites was easy, and for me, who had to work, it was convenient for getting where I needed to be. There was a small problem with the clothes washer, bad smell the first time. It seemed to go away after the first use. Also, the dishwasher in the big apartment didn't work, but we just used the one in the smaller apartment and told Sophie to deal with it after we left. Given how responsive she and the staff were I am guessing it has been repaired. We left a phone in the pickup car, and Sophie was a big help in recovering it. 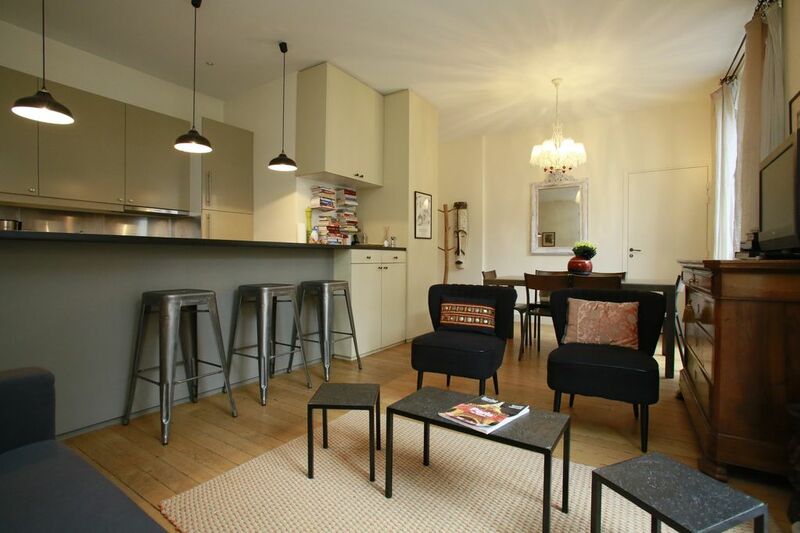 Great appartment - Vibrant Marais - Beautiful Paris! We (4 children and 6 adults) spend 5 days in beautiful Paris in the two adjoining apartments in Marais. Everything was perfect from the airport pick up until leaving the apartment. The apartment had all we needed and was in mint condition – clean, spacious, good beds, wifi, and a really GREAT location. Perfect spot for exploring the city. We will be back. We were a group of 6 girls (supposed to be 9 so we ended up with extra space) spending a long weekend in Paris and the two apartments were absolutely perfect for us. They were comfortable, spacious and elegant and the location was fantastic - so many nice shops, bars and restaurants close by. The hosts were really responsive and helpful and we all agreed we would definitely look to stay there again whenever we are next in Paris. This 2 bedroom/2bath apartment with adjoining single apartment met our needs for 3 couples perfectly. The location is great as we love the Marais district of Paris and the apartments are conveniently located within walking distance to Metro station, restaurants, cafes and more. (2 minute walk to the Picasso Museum) The owner was most attentive to our needs, Gaela, Fanny and Sophie were splendid to work with. We look forward to renting this apartment again when we have the opportunity to revisit Paris. The rental was great, it was conveniently located to where I am stationed for work while in Paris. All of the amenities I needed were available in the apartment and even when there was a slight issue with the shower in my bathroom Rent My Home in Paris was super responsive and had the issue repaired within the hour. I would recommend staying in this apartment / working with Rent My Home in Paris! My family loved the rue Thorigny apartments and le Marais! We may require a one week min stay for very advanced bookings or during high season. Nightly rate could range from 571€ to 657€.